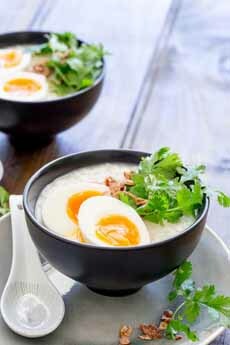 Many Asians start their day with a warm bowl of congee. If you’re a fan of Cream Of Rice or Cream of Wheat porridges, you’re a lock to enjoy the rice-based Chinese version. 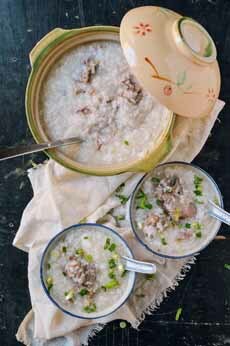 This traditional Chinese dish has evolved from gruel to porridge* to a porridge mixed with bits of protein (chicken, pork, shrimp) and vegetables (green onion, peas) to a spread of “DIY congee,” where the table is laden with dishes of condiments to tailor the dish to one’s taste. 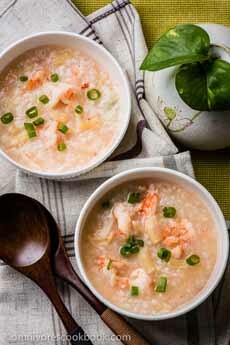 Congee can be as simple as a plain bowl of porridge, or as complex as the condiments and toppings allow. More luxurious versions cook the grain in chicken broth rather than water. It is easy to digest and very simple to cook. Plan to make it for breakfast or brunch, lunch or late dinner; serve as a DIY spread for a special meal (see the garnish options below); and reheat any leftovers on subsequent days. Congee (CON-gee with a soft “g”) is an ancient dish, made in China for thousands of years from uncooked rice and boiling water. Today it is eaten throughout Asia (known by different names), in Burma, China, Korea, India, Indonesia, Japan, Malaysia, Nepal, Thailand, Tibetan, Vietnam and elsewhere. The name in Chinese, which means the watery one, derives from the Tamil language of India, where kanji refers to the water in which rice has been boiled. It can be part of a meal, but is most often served as the main dish of the meal (and often, the only dish). Congee can be made in a pot or in a rice cooker. Some rice cookers even have a congee setting, for households who want to cook the rice overnight. 1. PLACE the water, broth, rice, salt and ginger in a large pot set over medium-high heat. Bring to a boil. Continue boiling, uncovered, for 15 minutes, stirring occasionally. 2. REDUCE the heat to medium low, cover and cook for 40 minutes longer, until the porridge has a creamy consistency, stirring occasionally. 3. REMOVE from heat the and keep warm. Discard the ginger pieces. Stir the chicken into the soup. Serve garnished with the green onions, cilantro, julienne-cut ginger and soy sauce, or let people garnish their own. You can serve congee family-style, from a casserole-type dish, or bring individual bowls to the table. For a party, offer as many as you like. At home, serve half a dozen options (including the soy sauce); but keep rotating them each time you serve congee, so it’s never the same dish. 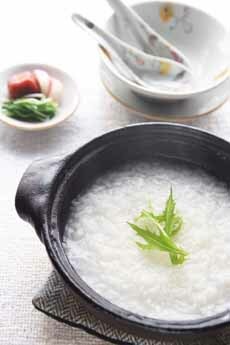 Simple congee looks just like Cream Of Rice, except it’s served savory, not with milk and sugar! Here’s the recipe from The Spruce. Congee With Pork & Scallions (here’s the recipe from The Woks Of Life. 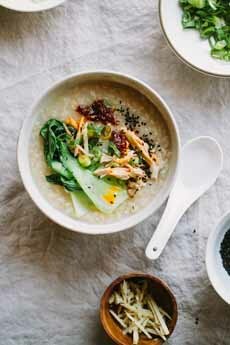 This Ginger Chicken Congee is made with brown rice. Here’s the recipe from Honest Cooking. Seafood Congee. Here’s the recipe from Omnivore’s Cookbook. A soft-boiled egg, crispy shallots and cilantro top this congee. Here’s the recipe from Sprinkles And Sprouts. Try it with other grains, such as brown rice, Cream Of Wheat, grits or cracked grains (bulgur, couscous, polenta. Or, do as Emperor Huang Di, and try millet. *Gruel is a cereal—based food—typically made from oats, rice, rye or wheat—boiled in milk or water. It is a thinner version of porridge. Some gruels are so thin that they are drunk rather than eaten. It is a food that is eaten every day, easy to digest, and thus also used during an illness. It is usually the first non-milk food given to infants, a food for the elderly and those with dental or stomach problems, and above all, comfort food. Some people call congee a soup.